Eugene, Oregon, U.S. - Federal Judge Ann Aiken has decided not to rule on whether or not ten convicted eco-saboteurs,who are responsible for a seven year campaign of arson in the name of the Earth Liberation Front and the Animal Liberation Front, can be defined as terrorists. She will likely offer separate decisions for each of the defendants during their sentencing dates, the first of which is next week. Today's court appearance was expected to conclude with a resolution on Terrorism enhancement issue. If the crimes were deemed to be acts of terrorism as the prosecution claims they were then the judge has the option of sentencing each defendant to as much as an additional 20 years in prison. Aiken is not expected to add any time to their sentences. If she does decide to stick any of the ten with a terrorism classification it will undoubtedly ensure that they are incarcerated in a more restrictive and violent institution than they would be otherwise. The label would also likely follow them outside of prison and could affect their ability to do normal things such as take out a loan, rent an apartment of fly in an airplane. She will likely offer separate decisions on the matter during each defendants sentencing dates, the first of which is next week. Some say that the government's desire to impose the terrorism label is a purely political move that has more to do with their failure to capture many actual terrorists that have threatened more than property than what the defendants are accused of. 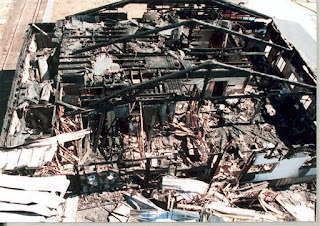 This is the first case in which the prosecutors have sought such an enhancement out of 1,200 arsons that have been claimed by Earth Liberation Front and Animal Liberation Front nationwide. Federal prosecutors also compared the defendants to the Ku Klux Klan who also burned down buildings. Amanda Lee an attorney representing Daniel McGowan objected to that characterization and noted that the difference was that on at least one occasion the KKK burned down a church while people were inside it, killing four young girls and that arson was just one part of the Klan's campaign of terror which also included murder and lynchings.